Whether shopping for yourself or a family of four, there’s no denying that your weekly trip to the grocery store can be an expensive one. At the dedication of our customers, Foodtown is making a bold move—we’re revealing some of our top tips for grocery shopping on a tight budget. To make your next visit one of convenience and affordability, keep these tips and tricks in your back pocket. Just don’t say you heard them from us! Never shop on an empty stomach. Shopping when hungry leads to impulse purchases that you wouldn’t normally make. You may grab one of those pricey gourmet cookies as soon as you get into the car, but chances are you’ll regret the purchase once you’ve satisfied your craving. Make a list and stick to it. Make a habit of preparing a list before each visit so that you know exactly what you need and what you don’t. Limit yourself to one grocery store trip per week. On average, shoppers spend more when making two to three “small purchase” visits per week, as opposed to one “large purchase” visit. Don’t discount store brand products. Despite what many consumers believe, store brand products, such as our own Foodtown brand and Top Care health and beauty products, are just as good as their brand name counterparts and often come at a lower price point! Shoppers will be pleased to find hundreds of our Foodtown and Top Care products throughout our supermarket aisles. Only purchase what you need. 10 for $10 deals are great promotions, but you don’t always have to buy 10 to take advantage of the savings. Think about what you need, review the conditions of the promotion, and consider the shelf-life of the product. Keep a running grocery list on your fridge. How often have you purchased a gallon of milk only to find that you still had a full gallon in the fridge? Make a habit of writing down items as soon as you’re running low. This way, you’ll know exactly what you need and what you don’t. Shop online. Many Foodtown locations offer Foodtown On the Go, an online shopping service with in-store pickup or home delivery. Take advantage of this and you’ll experience the same great prices and sales as shoppers do in-store, you’ll eliminate impulse purchases, and you can keep track of the final price before checking out. Plus, you can save even more with our digital coupons. Don’t always rely on prepared convenience foods. If you have the time, shred your own cheese and chop your own lettuce. Prepared convenience products tend to come at a high price point due to the labor and extra packaging that goes into them. Only clip coupons for items already on your list. Just because it’s on sale doesn’t mean you have to purchase it. If it’s something you’ll use, great! But if not, it’s okay to skip it. At Foodtown, our digital coupons application makes this even easier. Your coupons are loaded right onto your Club Card for use when shopping, meaning no more flipping through (and potentially misplacing) paper coupons. Consider going solo. Kids are a prime target for the advertising industry, especially when it comes to cereal and sweets. If you can, keep the kids at home to avoid making purchases on products or brands that you wouldn’t normal buy. 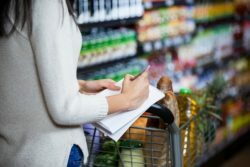 In addition to these helpful tips for grocery shopping on a budget, Foodtown offers numerous ways to save on your next visit. Shoppers will experience the same great prices and sales whether shopping online or in-store. Plus, they can take advantage of the ongoing savings found in our weekly supermarket circular and download digital coupons on the Foodtown app. With these tips, tricks, and savings in your shopping cart arsenal, you’ll enjoy a lower grocery bill with each and every visit. Locate the Foodtown supermarket nearest you to put these grocery shopping tips to the test. We can’t wait to show you your final bill!